Rapper XXXTentacion attends the BET Hip Hop Awards 2017 at the Fillmore Miami Beach at the Jackie Gleason Theater on Oct. 6, 2017, in Miami Beach. XXXTentacion’s record of abuse is no secret; for as long as his singles have been popping on SoundCloud and Spotify, fans have been aware of the charges leveled against him, including domestic battery by strangulation, false imprisonment and aggravated battery of a pregnant woman. Now, in a new profile from the Miami New Times, XXXTentacion’s ex-girlfriend and accuser, Geneva Ayala, has come forward with harrowing details about her time with the rapper, whose real name is Jahseh Dwayne Onfroy. Ayala’s account is a dizzying chronology of abuse and manipulation that began once she moved in with the rapper in late May 2016. The first time he hit her, Ayala says, she had been admiring a friend’s new grills in a Snapchat video, an offense that caused Onfroy to smash her phone to the ground and strike her across the face. Not only would he strike her again that same day, but he also threatened to brutalize her with a long-handled barbecue fork or a wire barbecue brush (Onfroy made her pick which one). Ayala told the New Times that Onfroy’s “favorite thing” was to backhand her across the mouth because the welts appeared on the inside of her lips. She also recounts emotional abuse and manipulation, saying that Onfroy would repeatedly threaten suicide. He also filled a bathtub with water, dangled a microwave over the bathwater and threatened to drop it. As is common with abuse cases, Ayala’s offenses were minor. 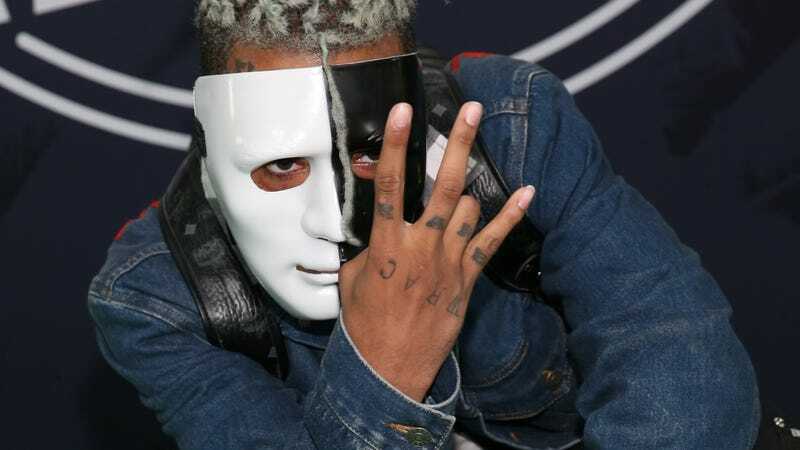 According to one witness, Onfroy once beat Ayala because she had laughed at one of his producer’s jokes. The witness also makes clear that the abuse was no secret within Onfroy’s circle. Ayala’s breaking point came months later, on Oct. 6, 2016, when Onfroy savagely beat a pregnant Ayala so badly that she lost some of her vision. After the beating, Onfroy took her phone and left her in his manager’s back room for two days. The rapper has received additional scrutiny in light of the #MeToo movement, though much of the conversation around him has focused on the lack of public repercussions for his actions. Onfroy landed a highly coveted spot in XXL’s 2017 “Freshman Class,” with Editor-in-Chief Vanessa Satten confiding on The Breakfast Club that he was a landslide pick for the No. 1 spot. Recently, Spotify attempted to penalize the rapper under its “hateful conduct” policy, barring his music from the streaming service’s discovery algorithms and playlists. After Spotify reversed the policy just weeks later, Onfroy was back on the app’s most popular playlists. The article makes the case that Onfroy’s violent persona—given credence by the charges brought up—propelled his music career. And that rabid fandom, deeply invested in the rapper’s troubled and troubling record, has been just as dedicated in dogging Ayala as it has been in supporting XXXTentacion himself. When she took a job at Dunkin’ Donuts, Ayala says, XXXTentacion fans found her and began showing up to her job, where they harassed her, took photos of her and tried to follow her home. She lasted three weeks. And when Ayala started a GoFundMe campaign to raise money for an operation to repair nerve damage and a fracture near her eye (the result of another beating at Onfroy’s hands, she says), Onfroy’s fans claimed that the campaign was fraudulent, causing the site to delete her page and freeze the thousands she had raised (including $5,000 from Onfroy himself); the campaign has since been reactivated. Currently, Onfroy spends most of his time in a $1.4 million home in Parkland, Fla.; he’s expected to release a new album this month.